An outstanding free instructional video has recently been completed by Brian Hendricks. 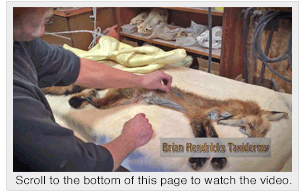 It shows all of the steps for mounting a lifesize red fox, and can be viewed at the end of this article. In May of 2015, Brian Hendricks of Scottville, Michigan joined an elite group of taxidermy artists who can truly be considered to exist in rarefied air. Only the best of the best have achieved the honor of winning the Master of Masters Invitational at the World Taxidermy Championships®. This unique competition is open only to former World Champion taxidermists, previous Master Division First Place winners, and World Show judges. 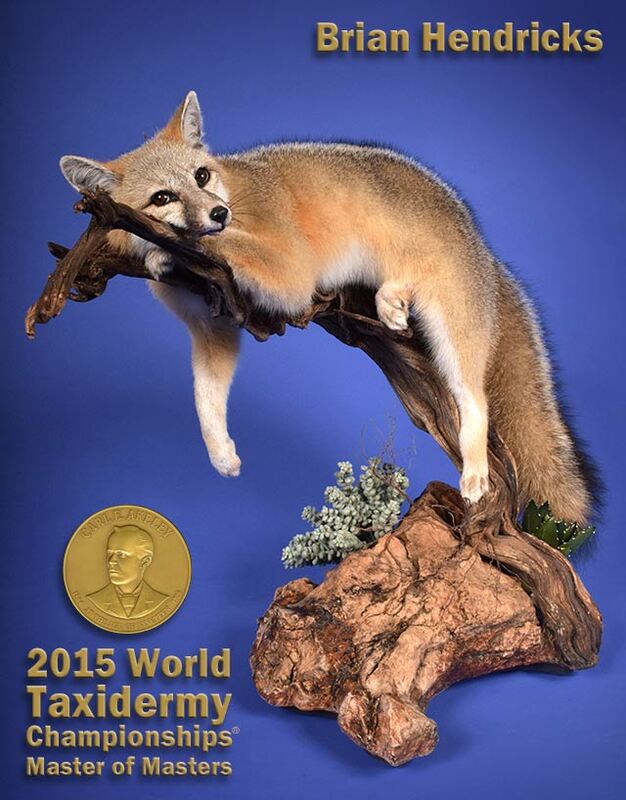 It is judged by a secret vote of the Master Division competitors, arguably the largest and most knowledgeable group of diverse taxidermy experts ever assembled in one place. When the votes were tabulated, Brian’s beautiful and amazingly soft grey fox was the big winner and earned Brian his second gold Akeley medallion. (He previously won a Best in World title in 1999 with Jamie Flewelling and Randy Wolfe for the Collective Artists Division). Brian’s grey fox reclining on a limb impressed the Master Division competitors enough to bestow the Master of Masters Award. 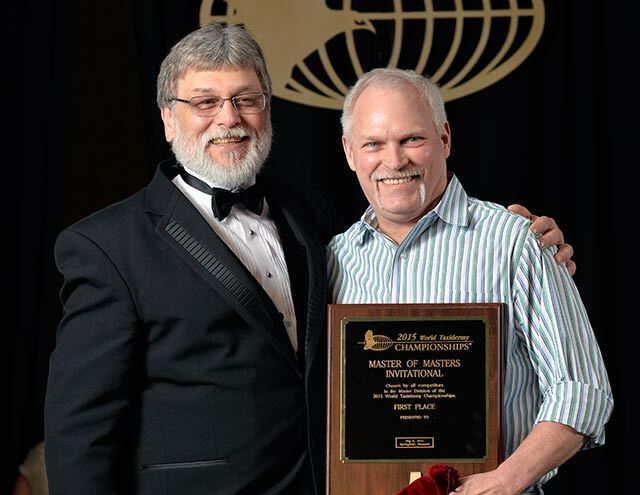 World Show Master of Ceremonies Russell Knight of Alaska presented Brian Hendricks with his Master of Masters Award. Receiving the Master of Masters Award for a fox mount was peer validation of Brian’s stature as a top innovator in mammal taxidermy. His groundbreaking mounting techniques developed into a new system for assembling lifesize mammals, with ingeniously designed mannikins, face mounting systems, head attachments and earliners. He sculpted an extensive line of bobcat, gray fox and red fox forms, in both conventional and Easy-Set® versions, which have been positively received in the industry. These innovative mannikins are available in a wide variety of sizes and poses, along with pre-made custom habitat bases to match each display. Many of Brian’s newer mannikins feature a unique head attachment which allows for different poses from the same mannikin. In the short video above, Brian demonstrates this benefit on one of his bobcat forms. 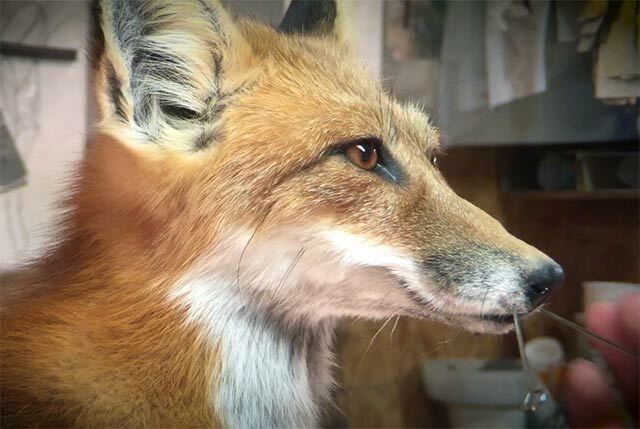 In the following 3 hour video series, Brian Hendricks demonstrates every detail of mounting a beautiful lifesize red fox. To watch the full series of this outstanding procedural seminar, click on the video player below. Brian has packed so much information into these excellent demonstrations that you are sure to come away with new knowledge and fresh ideas that you can incorporate into your next fox mount. To learn more about Brian’s new red fox mannikins, visit the McKenzie website at http://www.mckenziesp.com/Red-Fox-C3399.aspx.